One of my favorite parts of summer is waking up with a little breeze falling in my window and hearing the little birds chirping outside. But while I hear them I never really catch a real glimpse of them, always flying off in a blur. 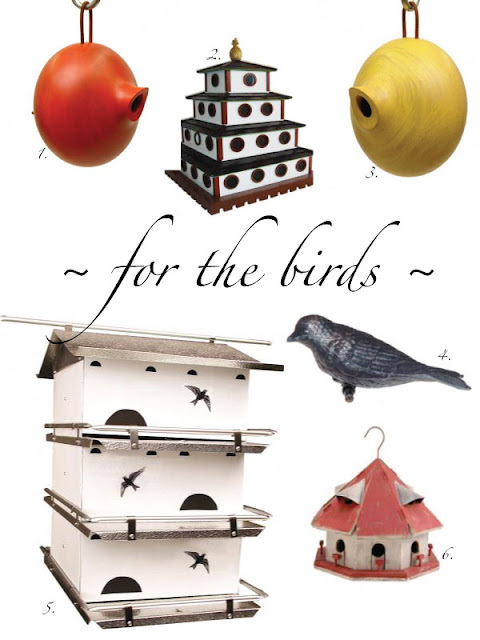 I have been wanting to get a birdhouse or birdfeeder for sometime but I guess I just haven't been too inspired by the ones I have found to actually get one. The truth is I know nothing about birds! Often when going for walks with my twins they ask me "what's that bird?" and the only one I can say with certainty is a bluejay. I think some might be finches or sparrows but actually I don't know the difference between the two. Which is pretty awful considering one of my twins middle names is Sparrow! I have often thought having a little birdfeeder in the back would be a fun task for my little guys to do as well as possibly turn it into, dare I say, a learning experience. Kids love animals, at least mine do, so I am certain they would absolutely be fascinated by getting regular bird visitors. My grandparents had a birdfeeder and I remember they always had such a variety of birds that would stop and peck around, we would sit in their lawn chairs and watch them in evening. My favorite part was when mama's birds would bring their little baby birds with them to have a snack. This might have had something to do with the fact that my favorite childhood book was Dr. Suess' "Are You My Mother?" So here is a little collection of some I put together from the backyard chirper, that are so unique and different, I am seeing a birdhouse in my future! This was a sponsored post by the backyard chirper.